No, not a new term of abuse (well, not that I know of), but my latest collection (when you move from having two of something that you don't even need one of, to three, that's the start of a collection). It started with a sad onion (the small one). I can't even remember where he came from. But when I was in a charity shop in Eastbourne with Sebastian last year, we heard the staff talking... 'What happened to the sad onion?' 'I haven't put it out yet.' I pricked up my ears. 'Sad onion? Please can I see the sad onion?' 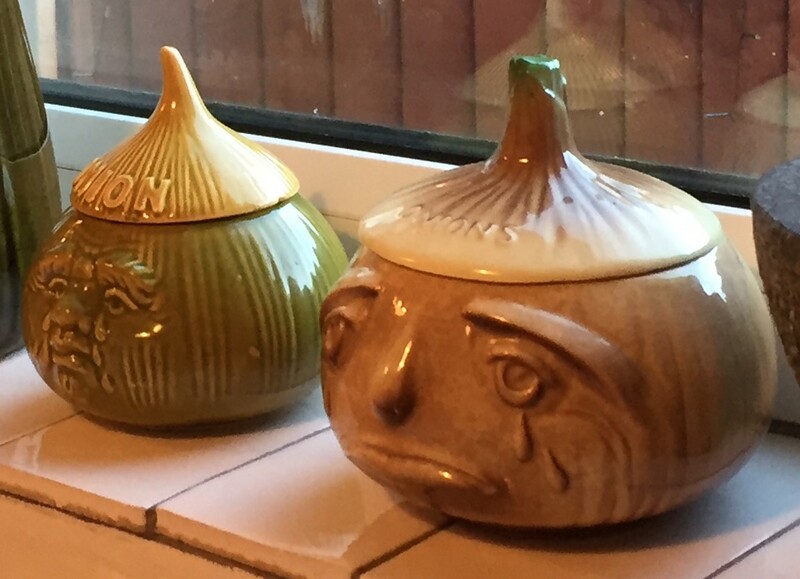 Because obviously, when you have a sad onion, you need another sad onion. The second sad onion is in fact a classic SylvaC sad onion. Then on Saturday I was on the phone to Sebastian, and he asked me if I collected sad onions. Well, I said (mistakenly, as it turned out) I don't think there are that many different sorts of sad onions out there. So I would willingly widen my collection to embrace anthropomorphised pottery vegetables of any variety, displaying any emotion. and he looks very grumpy. Or possibly disappointed. I mean, I would, if I were celery. None of these things is any use as a receptacle. The sad onions are too small to hold anything other than a very small quantity of very small (or finely chopped) onions, and the celery pot (vase?) leaks copiously if you fill it with water (although I admit that might not be a deliberate design feature). It doesn't look much like any celery I've ever seen either. Lucky it's got 'CELERY' written on it - on both sides - or I would have taken it for a pointy cabbage pot. But none of that is the point. It is a collection, perfect in its pointlessness. I may be completely off the mark here but I'm betting Marie Kondo's philosophy is not yours.